Hey to all you wild ones out there! 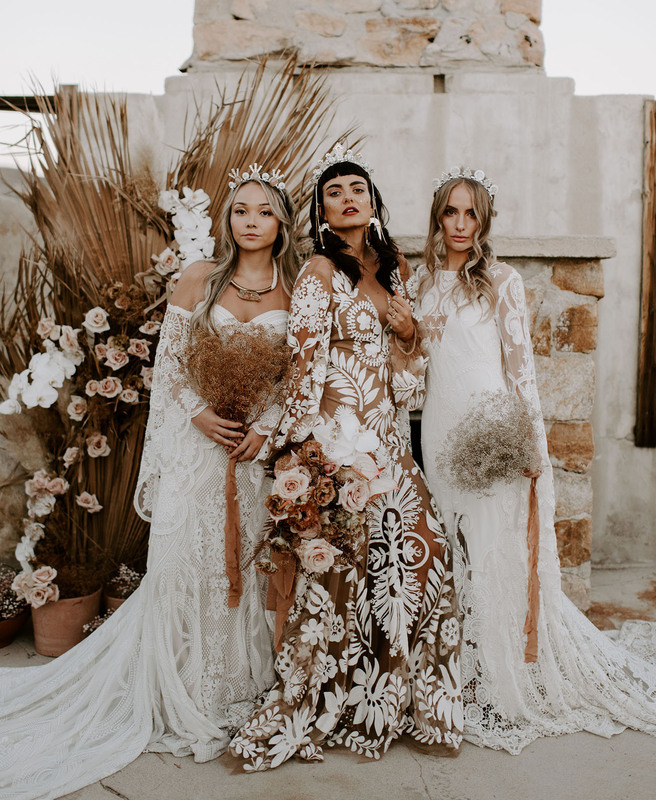 Have you by chance heard of the ‘Wild Ones’ and the workshops they host? 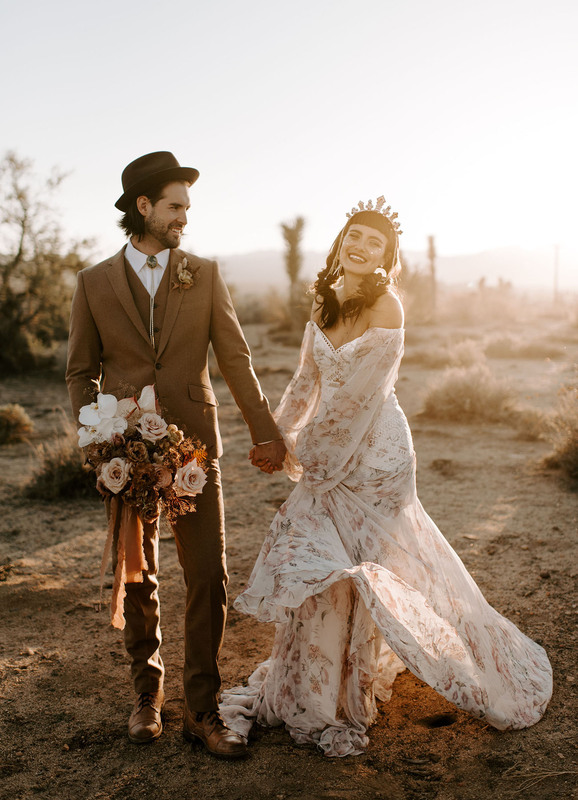 Started in October 2016, the team has organized close to 30 workshops all over the world, where photographers come to build their portfolio and develop skills…all while on a wild adventure! 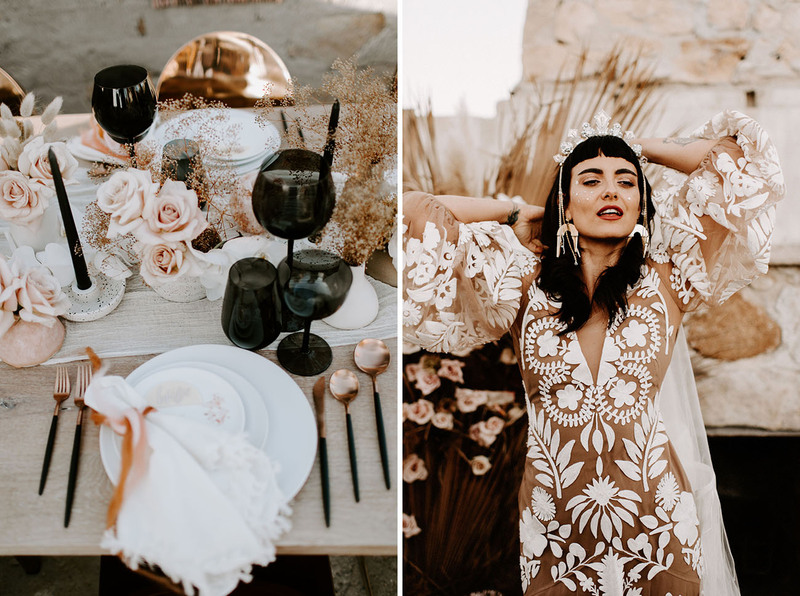 And, it just so happens that today’s GORGEOUS editorial is the result of just that! In case you’re not a photographer—no worries! 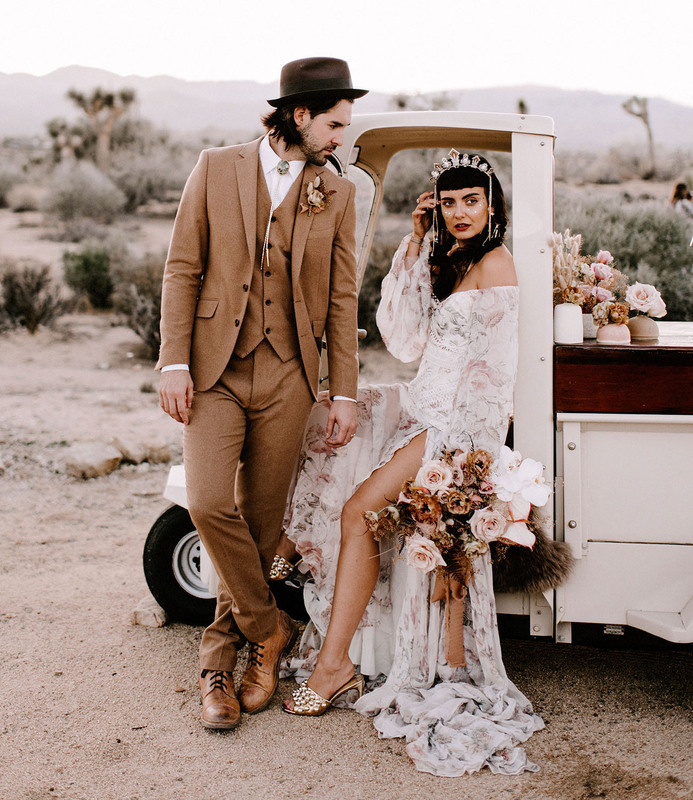 Today is chock full of seriously gorgeous wedding inspo in the desert. 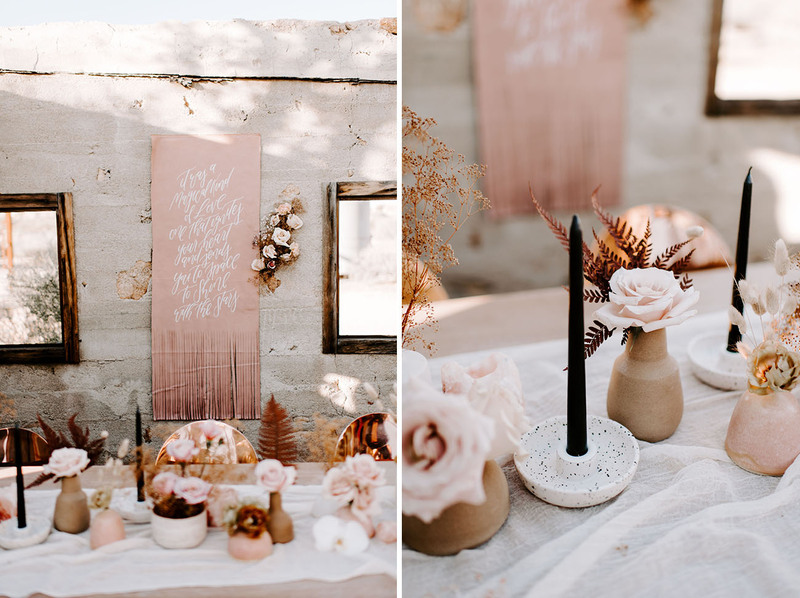 Playing with nudes, mauve and hints of rose gold, Laura at Perfectly Poised Events crafted a palette that is modern and cool, yet perfect for the desert setting. 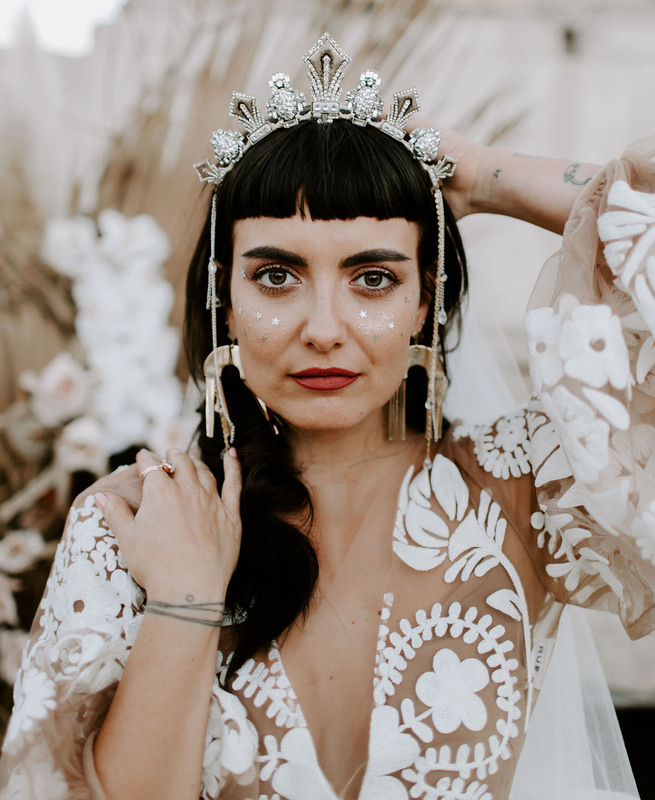 A majority of the photos in this first part are by Peyton Rainey Photography, with a few snaps from Nicola Dixon Photography + Dawn Photo (you’ll see more from them in Part 2!). 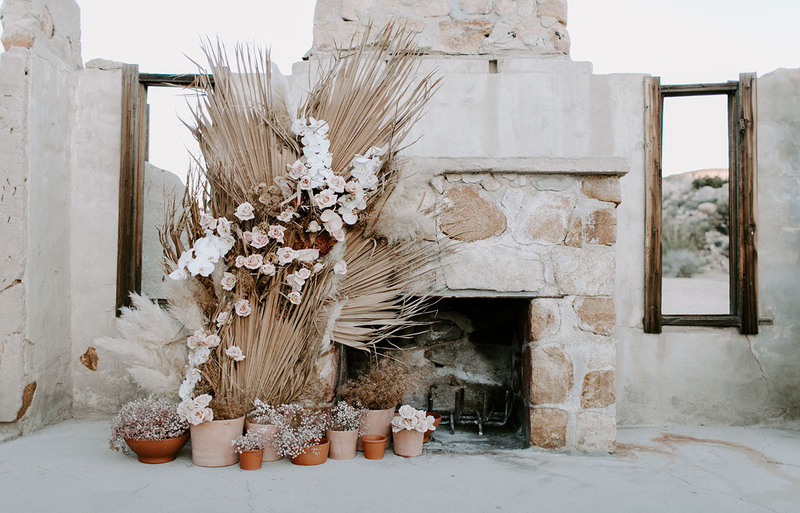 Ready to head out to The Ruin Venue in the desert? 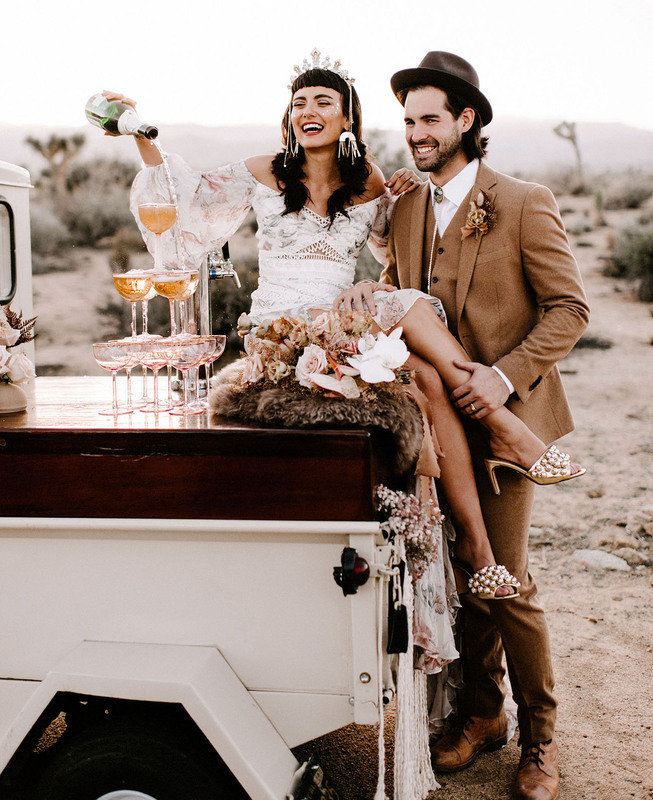 Grab your boots…and perhaps a bottle of champagne, let’s boogey! 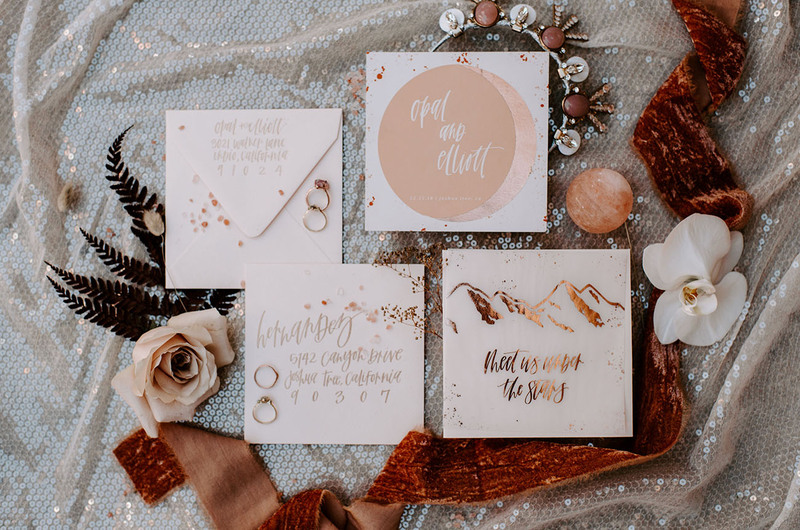 To kick off the day, Double Dipped Calligraphy crafted this stunning invitation suite that is both celestial-inspired and yet earthy. 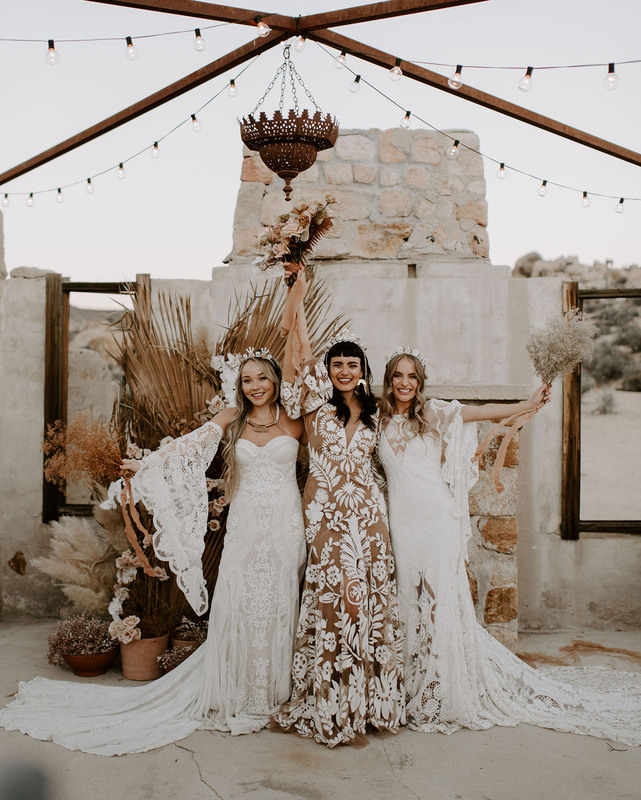 Aren’t those Rue de Seine gowns from a&bé Bridal Shop dreamy?! 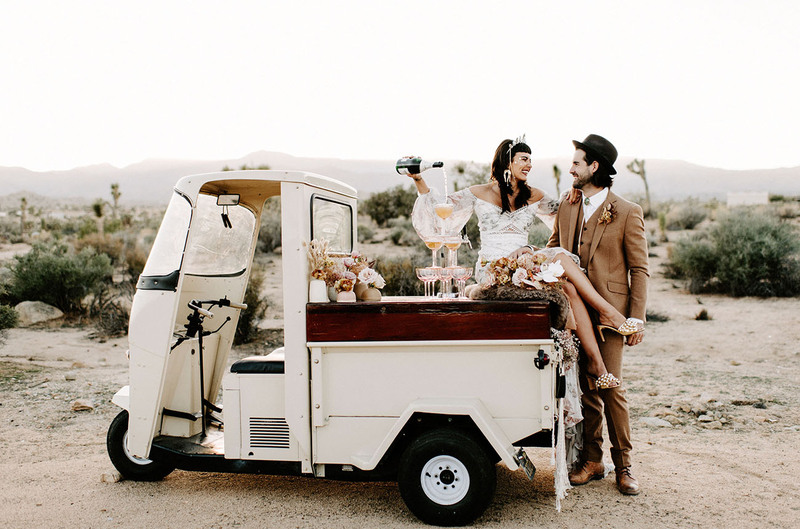 Perfect for a desert wedding…or the beach! 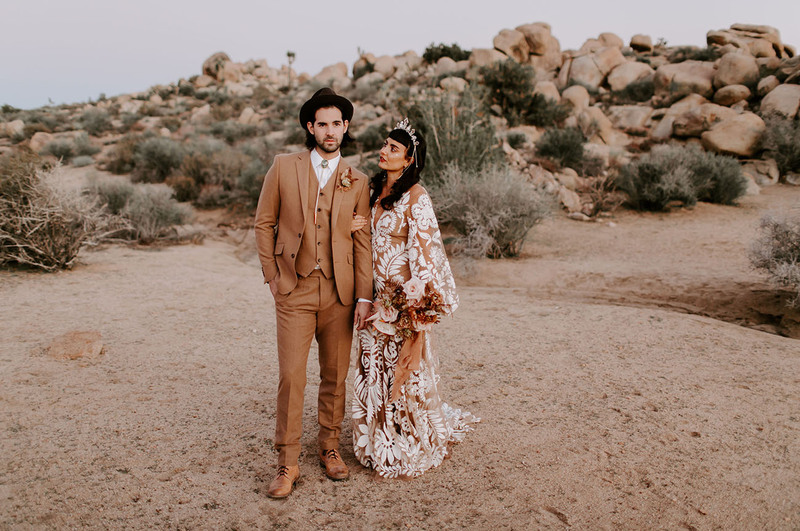 Going with a sort of ‘bronzed goddess’ meets ‘desert princess,’ with a touch of Coachella-inspired style (because when in the desert, right? ), Hair By Kayti + KC Witkamp created show-stopping looks! Oooh la LOVE! 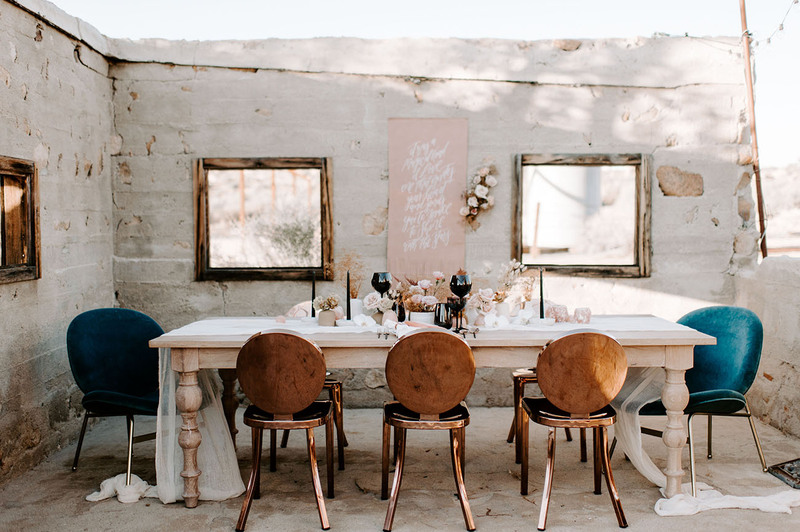 The brunt orange/rose gold chairs were perfectly complemented by the blue ones from Collective Rentals. Such a gorgeous palette, no? 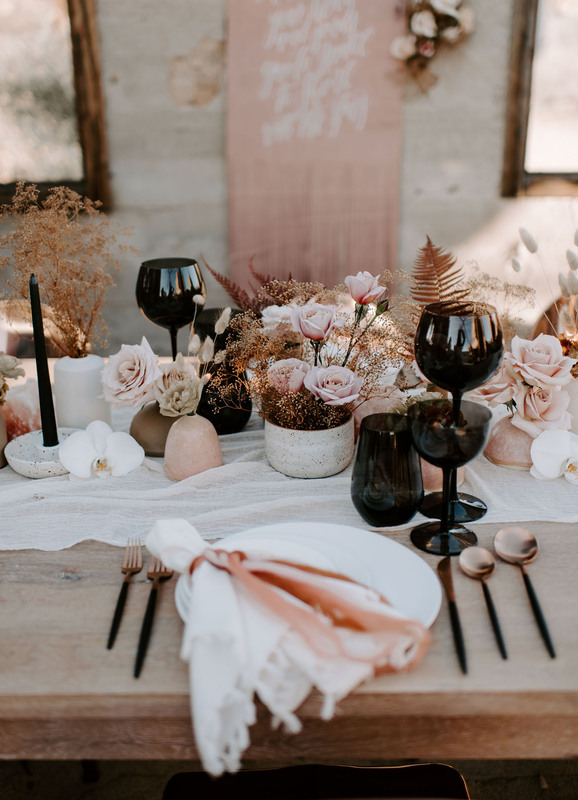 We adore all the rosy hues + the stark contrast of the black! 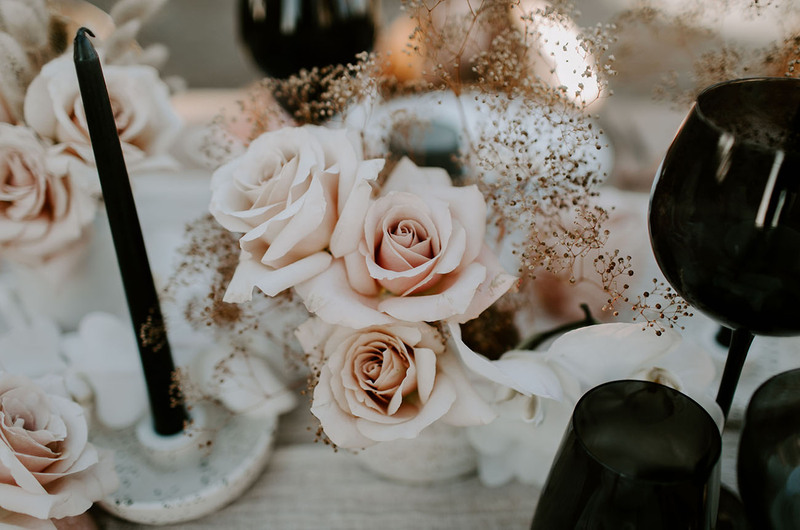 Best Day Ever Floral created subtle yet striking floral arrangements for the tables that really tied everything together, don’t you think? 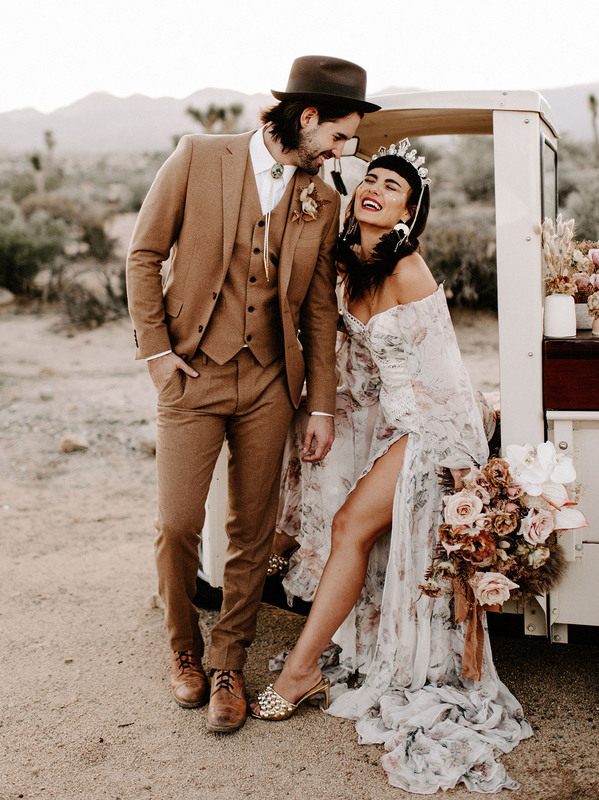 Holy smokes…from the gilded shoes, to the patterned dress, to his suit, that crown, and those florals—our eyes keep bouncing from one pretty thing to the next! Pour that champagne + bring on the celebration!! Stay tuned for Part 2 of this workshop, coming up in a couple of hours! And…for those that were seriously inspired by this (we know we were! 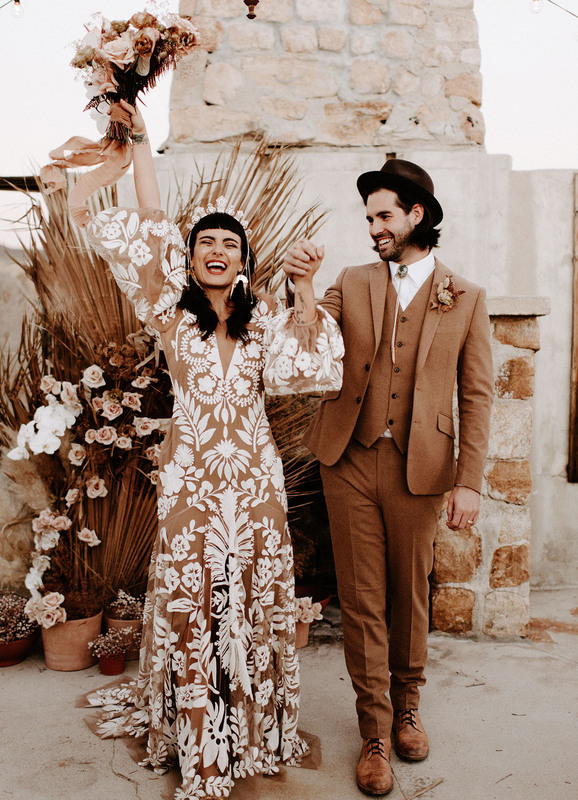 )—we’d love to hear what elements you’d incorporate into your big day. 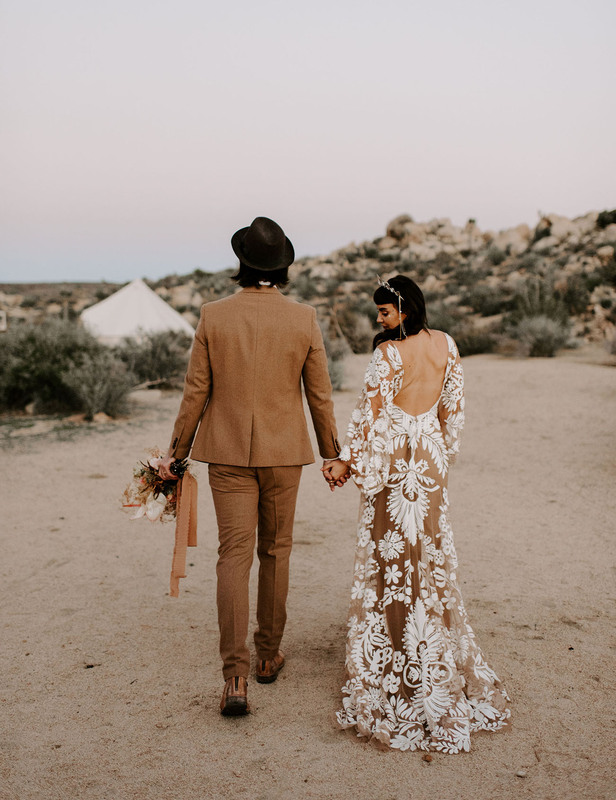 The gowns, the florals, the venue in the desert…or something else?? Let us know in the comments below!